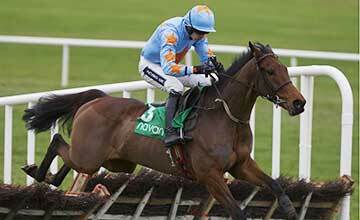 Is Un De Sceaux a real live Champion Hurdle contender? Will the Fly be undone by an inside job? Just how classy is this French bred 6yo? Is he really a Champion Hurdle contender? Is beating up small fields the limit of his abilities or is there plenty more to come? There is no hiding the fact that he is an extremely tricky individual to assess. We have seen him 4 times over hurdles in Ireland resulting in 4 bloodless victories with ever increasing winning margins; 6L, 13L, 29L & 53L. Before he moved to the Mullins yard he raced twice in French bumpers again resulting in 2 bloodless victories from the front (20L & 7L). Nothing has managed to get anywhere near him…but in truth nothing in-behind has actually been that good! The facts are I don’t know how good he is, you don’t know how good he is, hell even Willie Mullins probably doesn’t really know how good he is. Ruby Walsh is probably in the best position to gauge how good he is being that he also rides Hurricane Fly and can at least compare and contrast the feel, power and slickness he gets from both beasts. In truth though he is only really able to take a rough guesstimate until the horse is put under pressure from some proper Graded hurdlers. The one thing I do like about Un De Sceaux is the fact that he goes out and makes his own pace. He is at least belting along at a decent rate and jumping at speed rather than sitting in behind lesser opposition and cruising on past them at the final flight. He is a quick and accurate jumper of a hurdle to my eye and although he has never had to contest the lead, hence he has never had his jumping put under any sort of pressure, I can also see a situation in the Champion Hurdle where he is allowed an ‘easy’ lead. It’s not impossible that he could belt along out front with an easy lead at Cheltenham, skip the pack and they don’t see him for dust; of the likely runners is there another front-runner in the field? You would be hard pushed to say there is another out and out front-runner in the entries and given we don’t know exactly how good this lad is that could very well be free ticket to glory for him. Hardy Eustace led them a merry dance from the front as did Make A Stand, it can certainly be done if you have the right horse under you. Plenty of the above, however, is just conjecture. It’s good to float ideas and opinions out there but I would rather look at some facts to see exactly where he stands on the Champion Hurdle ladder. By facts I obviously mean trends! Track experience is clearly a big bonus before you tackle the Champion Hurdle, Un De Sceaux has none and won’t get any before the big day. It goes without saying that you want to be a multiple hurdle winner before tackling the sternest test of all, Un De Sceaux is 4 from 4 over timber. Proven Grade 1 winning form is a massive advantage coming into the Champion Hurdle, Un De Sceux has none is highly unlikely to get the chance to pick up some before the big day. Un De Sceaux – ?? You want to be mixing it in Graded company on your final start before a tilt at the big one. The word is that Un De Sceaux will have another run before the festival, so obviously we have to wait and see exactly where Mullins points him, but I have included this trend today as Un De Sceaux is yet to face Graded company in ANY of his 6 starts to date…and we are being offered in the region of 10-1 to 14-1 about his chances for the Champion Hurdle!? In fairness to the bookies I really can’t blame them. It is all a big guessing game with this horse. He is from one of the most powerful yards in the National Hunt game, is unbeaten in 6 starts and very much looks the part; if I were a bookie I wouldn’t be risking much about him either! This may be the real problem for him; he simply doesn’t have enough race experience. As impressive as he looks in beating up the small fields what is he really learning? More importantly recent history tells us that 4 runs (probably 5 runs by time the tapes go up) really isn’t enough experience under your belt to tackle this race. Don’t get me wrong, horses light on race experience CAN win this race, both Sublimity and Rock On Ruby has less than 10 hurdles starts before winning the Champion Hurdle…BUT they both had festival experience to their names, Un De Sceaux does not have the festival experience. In truth he will be coming into this contest way short on the experience levels that is generally needed to cope with the rigors of this race, both in terms of number of races AND track experience. So what does UN DE SCEAUX need to do to turn himself into a real live Champion Hurdle contender? Now the festive period is well and truly done and dusted (woohoo!) thoughts naturally turn towards the Cheltenham Festival. As usual I will be opening up spaces on the full NTF service specifically for the festival itself. To make sure you don’t miss out on one of the slots simply sign up to the FREE NTF list – join here. On sign up to the FREE list you will also gain access to a number of FREE NTF guides to help with your punting activities. You will be able to join the NTF service for Cheltenham week at the start of March, details will be sent to you via the FREE NTF list. If he does try to make all, surely this will be just the sort of pace-setting that The New One needs and singularly failed to get at Kempton over Christmas? Whatever, it promises to be THE race of the Festival. Certainly could see him setting it up for one of the closer in-behind…unless of course they give him too much rope and can’t get to him! Providing they all get there in one piece it looks a race chocked full of talent! Love it! I agree Steve, his power, movement and jumping ability (up, over and away from hurdles in very smart fashion)do impress me. Think we’re looking at this race a year too soon for him. I do think he will benefit greatly from the experience he gets this year in the race, as the stats say a vast majority of Champ Hurdle winners have already experience the Cheltenham undulations.